Import of brake parts in various categories viz. Rotors, Calipers, Brake Drums, Brake Pads, Brake Lines, Brake Shoes, Pad Sensors, Brake Fluid and Brake accessories. The import was done using a spreadsheet of various brands and then two separate spreadsheets for each product category. For example once the brand spreadsheet was imported, rotors data could be imported using its app guide and Prices spreadsheets. The App guide excel consisted of various brake parts based on year, make and model and the prices excel then had the brake parts available in various brands along with actual part number, prices and many other details for the respective brake part`. The prices spreadsheets had a lot of data to process with most of them having around 80 columns and rows running over 50,000. But the import process was very quick in spite of such huge data and took maximum 3-4 minutes. The products were accessed using a combination of year, make and model and could be filtered in various ways through product categories, brands or directly using year/make/model and then selecting the respective category. Each product could be accessed using its details page, which in turn had “Add to Cart” button which presented to the user various parts with different specifications / prices and the user could add to cart based on his / her preference. The user can add multiple products, select shipping method and then checkout and make payment using the PayPal credit card option. Once the orders are placed, the user can track them through his / her account. The Admin / CMS panel also had the option to track orders as well as place new ones as can be done from the frontend. Once the orders are placed, the brakeworld associates after verifying the order submit it for processing so that the respective parts can be checked / procures and then dispatched to the customer. 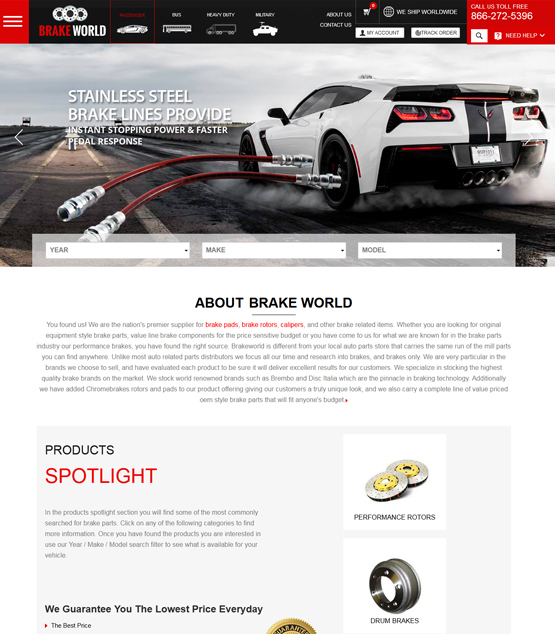 At each stage the status each part in the order is updated by the brakeworld associates. Manage Orders also had the facility to print the receipt, print labels, etc. Tracking of orders through various carriers in admin and frontend was also there. Return requests were also managed through frontend and admin. Invoices and Apply credit (for NET / wholesale customers only) were built separately on devexpress. Other than functionality, many SEO related static pages were also updated as per the new design. A new customer could be added using the CMS and multiple orders could be placed for the same customer from the admin panel unless intentionally cleared from session. Other than the usual customer, a NET / wholesale customer could also be added which had different process applied to their cart at the time of checkout. Brands also could be added through CMS panel. There was also extensive implementation of discounts as per the data imported into the system and various rules applied thereafter based on product and customer. Apart from discounts, the application also had Manage coupons functionality.